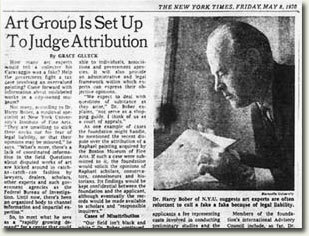 In the wake of highly publicized art frauds in the 1960's, and the failure to pass legislation to protect scholars from liability in expressing opinions, Assistant Attorney General of New York State Joseph Rothman and a group of eminent scholars (including: Harry Bober, Professor at the Institute of Fine Arts, NYU; John Rewald, Impressionist scholar; and José Lopez Rey, the great Velasquez specialist) got together to form IFAR. 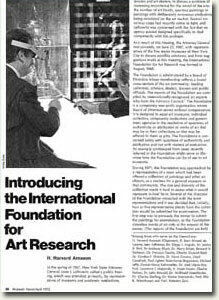 It was their conception that IFAR would serve as an independent scholarly bridge between the public and the art world on attribution, authenticity, and other important art issues. Over the years, IFAR has researched and written authentication reports on more than 600 objects and has reviewed thousands of others. In 1973, in response to the growing problem of art theft and looting, IFAR undertook a three year feasibility study of the museum and gallery community worldwide to determine the scope of art theft and what could be done about it. The result was the establishment of the first publicly accessible archive of stolen art. Since its inception IFAR has been involved with art scholarship and law, but it has been a particular focus since 1987, when IFAR established an art-law section of its publications, and simultaneously created a Law Advisory Council to sit alongside its Art Advisory Council. IFAR is one of the only organizations which has consistently covered the full range of art-law issues in all their ramifications. In furthering its mission, IFAR has worked closely with government agenices such as U.S. Customs, the FBI, The Drug Enforcement Agency, and local police departments. Both the FBI and U.S. Customs have awarded IFAR citations for meritorious service. IFAR's members have been treated to in-depth discussions of the complex issues involved in WWII era restitution since 1979, when IFAR covered the landmark civil suit of the Weimar State Picture Gallery v. Edward Eliçofon. As a nonprofit organization with no property to claim and a diverse audience to serve, IFAR has tried to shed a bright and even-handed light on the difficult issues surrounding cultural property conflicts.